Here at Junair Spraybooths we understand that either upgrading or replacing equipment can be disruptive and take up a lot of time coordinating various works. With this in mind we have devised a tried and tested mechanical and electrical service package which simplifies the installation process for customers. Each package is bespoke to suit the project in hand; combining the complete installation means our customers only have to deal with one contractor, installation costs are reduced, projects are completed on time and we are able to ensure a consistently high quality installation. We have a professional contracts team who coordinate and project manage each installation ensuring there are no omissions from the specification and no clashes with other services on site. We have been managing projects ranging from installations of a single spray booth right through to a complete new automated conveyorised paint line for over 27 years. 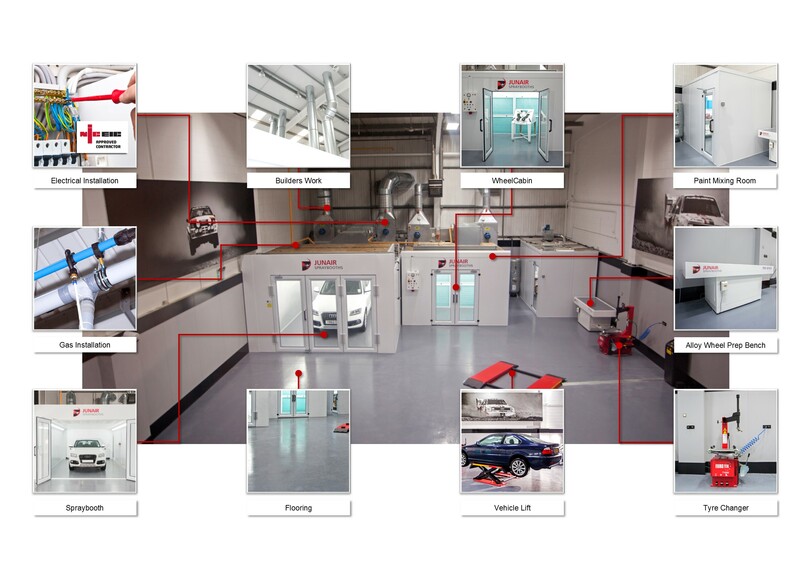 The example below shows a full Bodyshop installation completed and project managed by Junair. Click on the image to enlarge.